“That shouldn’t be a problem,” is the reply from LUCY SUGERMAN’s mother/business manager to my email about interview times. I’d suggested 11am, thinking that vaguely morning would be ideal on the day in question but not considering the matter too deeply. In the back of my mind though, it did occur to me that I might interrupting the singer-songwriter while she was in class. The morning plays out more or less how I planned it, and Lucy Sugerman answers my call, a couple of ticks past 11:00am. The book is Peter Skrzynecki’s story of a migrant childhood. Sugerman and I both drew the comparison between her class and ‘Reach Daylight’, the last song on her Hilltop Sessions EP. It’s feels as though I’m back in Year 10 English. “We study poems and they’re so thoughtful and every single word is a link. When I write songs–– It’s funny seeing all these links. But it’s interesting, seeing what people get from songs. Songwriting and performing are at the top of Sugerman’s list of priorities, always with a mind to better herself as a musician and a person. It makes sense, considering she’s not yet out of high school. But she is branching out – her parents are showing her the ropes of managing a business, and, come December, she’s curating her own show. She’s stepping out into the world of audio production too. It all seems to be part of a wider trend in Sugerman’s work of late; one of making things bigger and taking her music further. It’s all coming together for her aforementioned headline show at The Street Theatre. “I’ve never done anything like this before. I’m getting a band and everything, a four-piece band. I’ve always been an acoustic solo artist. It’s always been me by myself and so now I get to do the songs how I’ve never heard them before. And I pretty much have no idea what I’m doing, and I’m winging it, but it’s been a very cool process so far. She says the last point with defiance, as if it’s her personal mantra – keep moving forward, never stagnate, always keep developing. 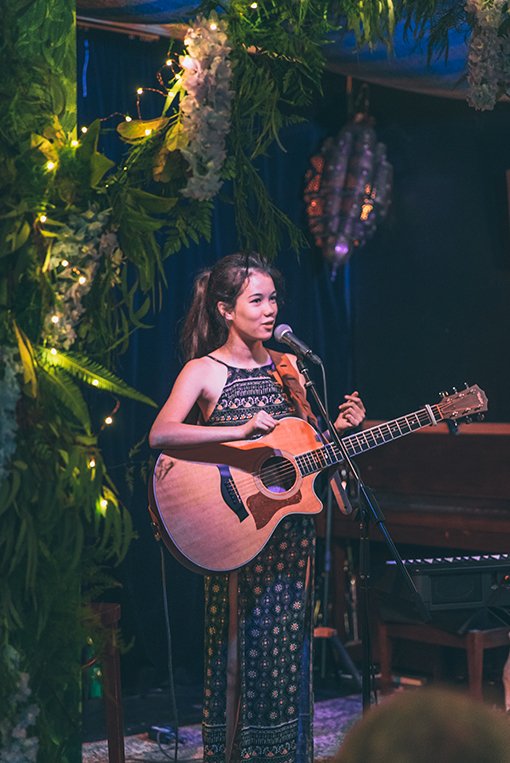 It’s a work-ethic that’s establishing her an early-career foothold in a notoriously daunting industry, and it’s already seen Sugerman taking out the Australian Busking Championships and making it to the final weeks of The Voice. But even a goal-oriented mindset can’t distract a high-schooler from discovering the music that they love. “I am a huge fan of Gabriel Aplin,” she says. We then talk about Sugerman’s reaction to ‘Look What You Made Me Do’. She’s rightly unapologetic – mature in her assessment of the controversy Taylor Swift inspires these days – but indignant at the same, that the artist who inspired her to start writing could ever be slanted. It all makes me consider how much thought Sugerman puts in to the kind of artists she wants to surround herself with as she embarks on her career. LUCY SUGERMAN and her band are set to play The Street Theatre on December 3 from 6pm, supported by AMBER NICHOLS and SOPHIE EDWARDS. Tickets from $25 via thestreet.org.au.